Celebrating its platinum anniversary, the Liberian Registry has been proudly serving the shipping industry for over 70 years. The Liberian Registry is comprised of 4,330+ vessels aggregating over 160 million gross tons, representing 11 percent of the world’s ocean going fleet. 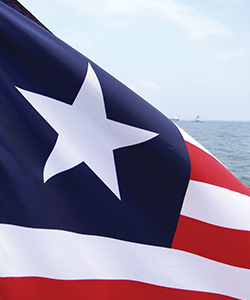 Liberia has earned international respect for its dedication to flagging the world’s safest and most secure vessels. The Liberian Registry is recognized at the top of every industry “white-list” including the International Maritime Organization and the major Port State Control authorities. As a founding member of the International Maritime Organization (IMO), Liberia has taken a leading role in global shipping at a very early stage and continues to be a member of the IMO Council. The Liberian Registry is administered by the Liberian International Ship & Corporate Registry (LISCR, LLC), a private U.S. owned and globally operated company. LISCR is internationally recognized for its professionalism and commitment to reducing redundant workflow procedures in order to increase efficiency. The Registry is managed by industry professionals who understand the business of shipping and corporate structures. Its proficient administration is one of the most effective and tax efficient ship and corporate registries in the world. The Registry has experienced exponential growth in fleet size and registered tonnage throughout its long history. This year, Liberia is the fastest growing major open registry in both the shipping and offshore sectors, with a growth rate significantly higher than its nearest competitors. The Liberian Registry has built a global infrastructure of support and provides 24-hour service to its shipowners and managers anytime and anywhere in the world. In addition to its 28 full-service global offices located in the major maritime centers of the world, the Liberian Registry is the first and so far the only major open registry to have trained a worldwide network of more than 450 professional nautical inspectors and qualified auditors. The Registry provides convenient, efficient and cost-effective certification services to shipowners with the option of Liberia’s unique “Harmonized Audit Program” which includes the Annual Flag State Inspection, ISM, ISPS and MLC, 2006 requirements. The Liberian Registry, headquartered in Dulles, Virginia (outside Washington, D.C.), maintains offices located around the world, including: Bergen, Buenos Aires, Cyprus, Dubai, Guangzhou, Hamburg, Hong Kong, Houston, Istanbul, Leer, London, Luxembourg, Monrovia, New York, Ningbo, Oslo, Panama City, Piraeus, Qingdao, Rio de Janeiro, Seoul, Shanghai, Singapore, Taipei, Tianjin, Tokyo and Zurich.